Powerplant: 652cc Fuel Injected Single-Cylinder, 5-speed trans. The BMW Sertão kicks the off-road capability of the G650GS up a notch with wire spoked wheels, longer suspension travel and a 21 inch front wheel. In the right hands (and the right tires), the Sertão is capable of exploring nearly any trail. However, it is still a large bike that can be a handful on technical trails for a novice. 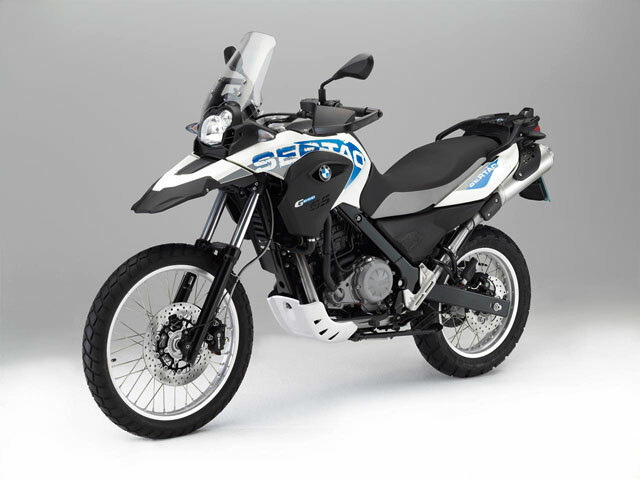 With the Sertão, you get a skid plate and full wrap-around hand guards that will protect the bike from damage off-road. ABS brakes are also standard and a large number of options are available from the factory like heated grips and luggage. The Sertão shares the same powertrain with the G650GS and both bikes will have a similar feel on pavement. Although, the Sertão rides higher and will have more dive on braking with the long-travel suspension. Power and gas mileage is excellent, making the Sertão a good option for long-distance travel. Cost of maintenance can be higher on a BMW than a Japanese bike and finding dealers near you may be difficult. If your idea of Adventure includes more than just occasional dirt riding, the Sertão is a great choice. You may also want to consider the predecessor of this bike, the F650GS Dakar. Built from 2000-2007, the F650GS Dakar is essentially the same bike as the Sertão.